In previous articles, we've talked about the importance of website traffic. We've also talked about how that same traffic is pretty much useless if it doesn't convert. We've talked about how conversion doesn't always equal an immediate purchase. In the B2B world, conversion means persuading the reader to take the next step in the buying process, such as downloading a white paper, registering for a webinar or agreeing to a free trial of your product or service more often than it means making an online purchase. For all of these situations, landing pages are very useful tools. But nowhere are they more useful – and more critical - than in an online ecommerce transaction. In this situation, you are trying to produce an immediate sale, and this is a much larger “conversion commitment” on your reader's part than simply giving an email address in return for a white paper. So it's vitally important to your online marketing success that you have all the pieces of your ecommerce landing page “dialed in”. A well-optimized ecommerce landing page with all of its elements working together to smoothly convert site visitors into eager buyers can help fill up your bank account in a hurry. A poorly-optimized landing page with anything that distracts your prospect from completing the sale can destroy your online marketing results and may even put you out of business. Are you trying to sell products directly through your website and other online pages? If so, not only do you need landing pages, you need to have them properly set up in order to maximize your conversion rate – i.e. - how many sales you make! The online sales process is a very fragile one. There are a lot of factors that can cause it to fail. However, if these issues are corrected and optimized, a business can strike gold. This article will focus on how you can leverage the power of ecommerce landing pages to maximize your conversion rate. We will discuss what to do, and just as important, what NOT to do. Let's take a look at the ecommerce process through your customer's eyes. When he's looking for products online, he's easily distracted. Not only are there lots of offline distractions such as friends, family, coworkers, cell phones and TV that can cause him to lose interest, there are a lot of distractions online as well, especially since the advent of social media. In order to make the sale, your ecommerce “engine” has to capture and keep his attention until he enters his payment information and presses the order button. So what can you do to increase the likelihood he'll buy? Think of online marketing as a chain. The chain is made up of links. If all the links are strong, so is the chain. But one weak link can cause the chain to break, even if every other link is super strong. Your landing page is but one link in your ecommerce chain. You can have a very strong landing page, but you will still get poor sales results if your other links - your PPC ads, your SEO, your email and website copy and layout (in situations where you are trying to drive traffic from them to your landing page) – are weak. So by all means, have a strong landing page “link”, but don't neglect the other links in your ecommerce chain. This first tip relates less to your landing pages than it does to your overall ecommerce strategy, but it's still very important. Whether you are driving traffic from an email, a link on the sidebar of your website, or a PPC ad, do not drive traffic you hope to convert back to your homepage. Drive it directly to a highly customized landing page. Like we've said before, confusion kills conversions. When your reader searches for a product like yours, it's because he's interested in buying, or he's at least thinking about it. But, he's also in a distracting online environment that can easily take his attention away from you. His Google search gave him other options besides yours. If your buying process confuses him, chances are he'll give up on you and go search for one of your competitors. Also, if he finds it difficult or stressful to buy from you, you'll probably lose him. When he clicks your PPC ad or organic search link, he wants to immediately see the product he's searching for - on the next page. If instead, you send him to your homepage, like so many online marketers do, he just might start thinking that it's confusing and hard to buy from you. If he feels this way, chances are he'll quit and go somewhere else. So remember this: when you want your prospect to pull out his credit card and buy from you now, direct your traffic from your PPC ads, your emails, your social media links, etc. to a targeted, specific, relevant landing page with the exact information he's looking for, NOT to your website's homepage! In keeping with this vitally important idea of eliminating confusion and making it as easy as possible to buy, review your ecommerce landing page and eliminate any steps that you don't need and that may cause confusion and difficulty for the buyer. If your ordering process does require multiple steps, immediately make it crystal clear to your prospect what each of these steps are. An excited, eager-to-buy prospect that is slammed with an unpleasant surprise that suddenly makes him think “Oh no! This is going to be a lot harder than I thought!” is likely to quit and go buy from one of your competitors. It's been said that sales is the art of getting a series of “Yes” answers from the prospect. What we need in order to sell successfully, offline and online is momentum toward the ultimate “Yes” of buying your product. You don't want anything that breaks up this momentum and continuity in your prospect's mind – anything that cause him to say “No, I don't want this”. So make sure that your design and the tone of your copy is consistent between all the pieces of your online marketing, including your ecommerce landing pages. Keep the same logo, the same color schemes, the same content theme, and so on. Not only does this help you with your goal of giving him the perception that he's effortlessly “floating down the river to his buying destination”, it makes you look like a well-established professional, not like a shady, fly-by night operator. Here's another tip to help you reduce the amount of confusion and difficulty your prospect feels; it's a valuable tip that will increase your ecommerce sales. On your landing page, show him the exact thing he expected when he clicked through to get there. If he clicked on your PPC ad or organic search link that came up after he searched for sledgehammers, don't send him to a landing page with an assortment of hardware and tools, even an assortment of different types of hammers. Send him to a page with nothing but sledgehammers. If his search is targeted and specific enough, try to send him to a page with only one sledgehammer. As we talked about a moment ago, consistency between the different elements of your ecommerce campaign is vitally important. Consistency between what your prospect is searching for and what you in turn show him is critical to your success. From the time your landing page visitor first searches for the type of product you offer, or he clicks through the link in your email or somewhere else, until he buys from you, or one of your competitors, he's on a journey. Do your very best to make his journey an easy one with few if any roadblocks. Typically, the fewer choices you offer on a landing page, the more likely you are to make a sale. But there may be times when you need to show more than one item. Remember this: if your searcher is looking for a particular brand that offers multiple products, make sure the landing page you direct him to shows only that brand. If your potential customer is searching for “Apple phones” and you take him to a landing page with Samsung phones at the top of the page and Apple phones near the bottom, you've added difficulty and confusion to his phone buying “journey”. And guess what. You've decreased the likelihood you'll make the sale. There's also a big chance he'll remember the unpleasant ecommerce experience he had with you, meaning he'll probably buy from someone else in the future. Do you want your ecommerce campaigns and your landing pages to give you maximum sales results? Of course you do. To enjoy these results, you need to optimize your approach to getting new traffic and winning new conversions. And you need to test. You need to do A/B split testing on the different parts of your ecommerce marketing system. This will help you optimize your campaigns for the short term. And over time, it will help you determine a solid group of best practices to follow. Are you are planning to use landing pages as part of your ecommerce marketing campaigns? Why not go with a proven winner? Why not use landing page templates that are designed to help you enjoy high conversion rates and offer you loads of valuable benefits, including simple-to-use A/B testing capabilities? Thanks to our new Integration with Paypal, now you’ll be able to build your first Ecommerce Landing Page easily and quickly. We’ll show you below, first hand, how you can set up your Online Store with Lander in just two easy steps using these new features! Now you’ll be able to use your Landing Page to show, promote and sell your products. Let’s take a quick look at how to set these up below. Once inside the editor of your Landing Page, just click on the advanced tools section and select the PayPal element. Of course, like always with our Editor, just Drag and Drop the element wherever you want into your Landing Page. From there you’ll see that all you have to do is complete the button with the items pricing, a little description of the item, and then your PayPal email account...that’s it! This new integration will allow you to be able to use your Landing Pages to showcase all of your products and set up your Online Store. However, If the standard Paypal Button look doesn't “float-your-boat” or just doesn't fit with your Landing Page style, no worries, we love awesome designs here at Lander! This is why we've decided to give you the possibility to customize your button and make it work with your favorite Landing Page Style. Try different colors, sizes, or even better…...maybe now’s a great time to test your Call To Action right? 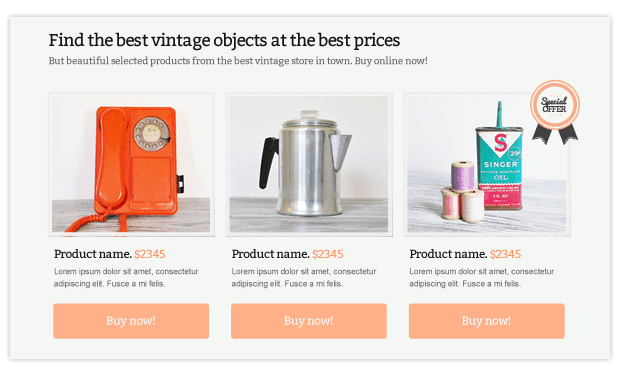 Also the typical “Buy Now” standard button won’t be the only option you can add into your Landing Page. Now you’ll be able to set up a complete Online Store with your Landing Pages and add other options like “Add to cart” and “Show my Cart”. Here at Lander we know it’s not easy to setup an Online Store from one day to the next. This is why our awesome designers have now created, just for you, a whole, totally new category with a bunch of new ecommerce Templates for you to choose from! Now that we have your attention, you might be asking: Ok..tell me more already! Well...it means that just like always, login into your account (or create one if you don’t have one, it’s totally free) and select the Landing Page Template that fits best with your Business and just Go! That’s right! It’s a completely new E-commerce category and they’re ready to use, so just include your products and start selling today! So, if you are planning to use landing pages as part of your ecommerce marketing campaigns, try out any of our New Ecommerce Templates that were specially designed to help you reach higher conversion goals than ever before, and we all know what that means... that means sales, sales, sales and MORE sales! You can create your free account and go for it today!